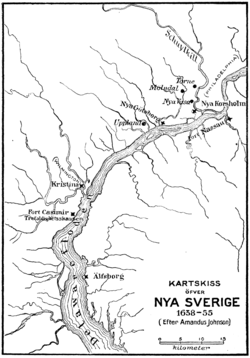 New Sweden (Swedish: Nya Sverige, Finnish: Uusi-Ruotsi) was a Swedish colony in North America that existed from 1638 through 1655. It was in the modern day states of Delaware, New Jersey and Pennsylvania. Its capital was Fort Christina, modern-day Wilmington. New Sweden was captured by the Dutch in 1655, and incorporated into New Netherland. ↑ "Delaware". World Statesmen. Retrieved 18 January 2015. This page was last changed on 13 July 2018, at 01:59.